Bonhomme Universe, a new public sculpture by artist Daniel Knorr, will be unveiled on December 5, 2017. Commissioned by Fortune International Group for Jade Signature, their new luxury condominium tower in Sunny Isles Beach, Bonhomme Universe is a continuation of the snowman sculptures that Knorr has been making over the last two decades. Knorr’s snowmen sculptures have been exhibited at the Museum of Fine Art in Hungary, Kunsthalle Basel in Switzerland, and the Villa Arson Contemporary Art Center in France. “We are thrilled to be able to share this unique sculpture with the world – one that celebrates Miami’s diversity, its beauty, soul, and welcoming atmosphere,” said Edgardo Defortuna, Fortune International Group President and CEO. “Bonhomme Universe is a tribute to this singular community and the camaraderie that permeates throughout. To have such a significant, symbolic work of art as the focal point of Jade Signature, created by the Pritzker-Prize winning architecture firm Herzog & de Meuron, brings us a great sense of pride. This piece will be a welcoming landmark for all who see it and an enduring source of inspiration.” The collaboration between Knorr and Fortune International came about through Liaisons, a Miami-based art consulting firm. Knorr first began working with this familiar shape when he became fascinated by the conceptual possibility of a snowman existing without snow. In Bonhomme Universe, he re-locates this cold-climate object to a sub-tropical environment, releasing it from the material it was once reliant on. 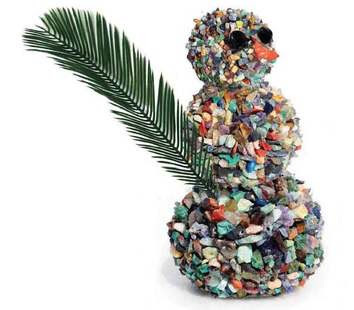 Inspired by the colors of the Miami landscape, Knorr decided to cover this particular snowman with an array of vibrant gemstones sourced from around the world. These natural materials reflect the diverse mesh of cultures found in the local community, a testament to Miami’s unique cultural identity. This is reflected in the title – in French, the word ‘Bonhomme’ translates to ‘good man’, and this message of kindness and generosity is the heart of the sculpture’s origins, as well as the sense of community Knorr hopes to inspire. Located on the beach behind Jade Signature, Bonhomme Universe stands 10.5 feet tall and 5.57 feet wide at the base. The sculpture is crafted around a metal grid of stainless steel, topped with concrete which is adorned with 28 different types of precious and semi-precious stones that have been polished and treated for durability, including green quartz, red jasper and moonstone. Instead of the typical broom for an arm, this snowman has a palm tree, fashioned from stainless steel. This extended arm serves as a friendly wave to passersby, but also has the deeper visual reference, with the palm tree an ancient symbol of peace, victory, and eternal life that originated in Near East and Mediterranean culture. Knorr will be in Miami for the unveiling of Bonhomme Universe and to participate in “Territorial,” Art Basel Miami Beach’s Public Sector sculpture exhibition in Collins Park located in front of the Bass Museum.